Northampton-based Paul C Barber is a master wallpaper hanger, and here he is running through the fundamentals of papering a large staircase, not a task for the faint hearted! An article covering the finer points will follow. 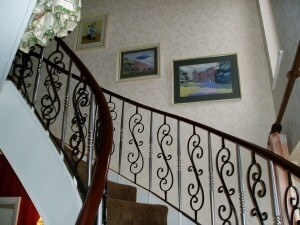 I recently redecorated a period property in Northamptonshire, it was a spiral design stairs with large hall and landing. It took 25 rolls of Sandersons Autumn Leaf paper . After I had prepared and sealed the walls, I then cross lined with 1200 grade lining paper. From the ceiling line I measured down the width of the lining paper and drew a line with a spirit level across the wall. When hanging the finish wallcovering to a staircase, the Golden Rule is to drop the longest piece first. This was 16 feet, great fun off the ladder and squeezing behind the staircase. – Paste the back of the wallcovering, or paste the wall, whatever is recommended by the manufacture. – Allow to soak (if recommended) and hang your first length. With the first piece hung, you then work away from both sides of the wallcovering, until you reach the landing and hall. Follow on until you reach a natural break. Another golden rule – never leave a wall half completed overnight. Always finish in a corner or by a door or window surround. Paul C Barber, specialist kitchen painter and wallpaper hanger based in Northampton, is the Traditional Painter responsible for hand painted kitchens throughout Northamptonshire. 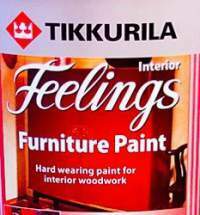 A member of the prestigious Wallpaper Hangers Guild, kitchen painter for A Bell & Co Ltd of Kingsthorpe and also a Dulux Select Fellow, Paul has been working at the high end of decorating for over 35 years now. Very nicely done! 16ft is a longer drop than I’ve ever done! Can you recommend any good wallpapering instructional videos. I want to try and wallpaper my living room just need a bit of help on techniques etc.